Maybe Our Brains Are too Puny? In one of the ironies in the history of twentieth century cosmology, it was a Belgian priest, Georges Lemaître—also a physicist—who, in the 1920s, proposed the “creation event” that would become known later as the Big Bang. Lemaître’s proposal was a way to come to terms with the theories of Einstein that implied an expanding universe, which baffled astronomers at the time. Lemaître suggested that the Cosmos had been expanding from an explosion at a single point in the unimaginably distant past. In the decades since the 1920s, the discovery of cosmic background radiation, with increasingly refined measurements of it, have verified his theory. Not surprisingly, Pope Pius XII was delighted that a Catholic priest had made such an important contribution to cosmology and confidently announced that Lemaître had provided confirmation of the Genesis story, i.e., “Let there be light.” God had triggered the creation event! It was a nice idea that seemed to meld theology neatly with scientific fact. But Lemaître was uneasy with this inference. It was reckless and unseemly for a theologian—even a pope—to jump in with speculation for which there was no evidence whatever. 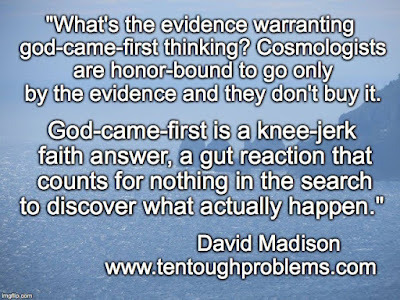 It was a faith idea polluting rigorous scientific inquiry. Lemaître sensed the danger in this because science could eventually find a cause for the Big Bang that had nothing to do with a god. Once again, theology would be embarrassed. The Pope was satisfied that God was lurking in the mystery that lay behind the Big Bang, but what would happen when that mystery was dispelled? Now, is it true—as theologians so earnestly wish—that there is deep mystery about the Cosmos that our science will never, ever penetrate? A mystery that a god presides over and that we are not meant to understand? If so, then theologians could be able to get away with the claim that “Where did god come from?” is not a legitimate question. At present, however, it just seems to be a ploy or ruse betraying intellectual laziness—or cowardice. After all, our intellectual journey as humans has been under way for only a few thousand years, and our understanding of the Cosmos has accelerated dramatically in only the last century. People who are acutely curious—and suspicious of flip, faith-based answers—are compelled to envy the intellectual achievements that we hope might have been made by other thinking creatures out there in the Cosmos. There may be others who have been probing, measuring and analyzing data for 100,000 years. With such a head start, they could have figured out the ultimate mysteries of the universe. Have they relied on religious intuitions and speculations? Of course we have no way of knowing, but look what happened on this planet. When secular thinkers and scientists have worked up the nerve—and mustered the clout—to say to preachers and theologians, “Go to your room. Mind your own increasingly irrelevant business,” our knowledge and understanding of the natural world have advanced exponentially. There is another possibility to be considered as well: Our brains may be too puny to “get it.” We are endowed with mammalian brains that evolved to survive in our specific and peculiar biosphere—and we’re pretty small scale. Einstein’s theories of General and Special Relativity, which must rank as among the grandest of human insights, are tough for even the best minds to grasp. Maybe the mysteries of the Cosmos are just impenetrable to us, not because a god designed things that way to keep us in the dark, but because evolution has provided us with—cursed us with—brains that are not up to the task. We may be the simpletons of our galaxy. Our excuse for dreaming is the desire to discover the origins of the Cosmos, and settling for the “God did it” non-answer just isn’t good enough. It’s settling for too little, something too humdrum. No matter how many superlatives preachers and theologians come up with—their god is all powerful, all knowing, all wonderful, yada, yada, yada—they are just piling on silly flattery without substance, in the absence of evidence and understanding. The confident assumption that there is an everlasting god who doesn’t have to be accounted for is a symptom of intellectual bankruptcy. David Madison was pastor in the United Methodist church for nine years, and has a PhD in Biblical Studies from Boston University. 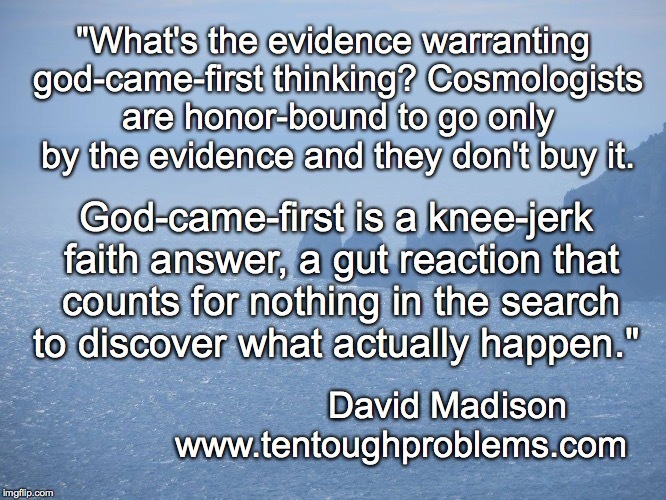 His book, Ten Tough Problems in Christian Thought and Belief: a Minister-Turned-Atheist Shows Why You Should Ditch the Faith, was published in August 2016 by Tellectual Press.